Forward. It’s the direction we want to move. But what about moving forward faster? If you’re like most small-business owners, you probably get frustrated every now and then (or more often) by a lack of forward progress. People in the business seem busy, almost frantic, yet you’re not getting results. So here’s a story you may relate to. It’s a typical day. I get in the car, turn the key, rev the engine, and back out of the driveway. Driving away from the house, I get the sense that the car seems tired. Yes, I notice I am definitely having to give it more gas to get up that familiar hill. “Hmm,” I think. I turn up the radio and keep driving. After all, I’m far too busy today to worry about a tired car. Suddenly, the engine roars (a loud ROAR, since I can hear it over the radio), and I realize I’ve lost power to the wheels. It’s like I’m in neutral. I coast to a stop. With my head against the steering wheel, I reach for my cell phone and call for a tow. Turns out (after paying my mechanic for several hours of labor) that the clutch was worn out, preventing an effective transfer of power from the engine to the wheels. 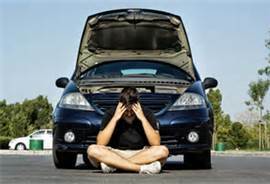 My engine stopped powering the forward motion of the car and instead began to overheat. While I was annoyed at the car, what really made me frustrated was, well, me. If I’d paid attention to the signals the car was sending me, I could have fixed the problem way before I’d needed a tow and lost a full day’s work. Are the people in your business working effectively or are they spinning their wheels? If you get the distinct impression that you can smell something burning, consider why all the activity you’re observing isn’t powering the company forward. Where is the disconnect? How can you transform the activity into progress? The good thing is that we can usually do maintenance on our businesses while they’re running (and before we need a tow)! On the top of a sheet of paper, write out where you want the company to be in the next 90-120 days. On the bottom, write a description of where your business is right now. Talk with your people and together sketch out the 3-5 steps in between. Keep the steps small and manageable. Tackle the first step. Track your progress weekly and adjust as you go to make sure you aren’t spinning your wheels. Are you a happy firefighter?